With Evangelion, Poland's Behemoth creep back a little into the world of black metal. Although the core sound remains rooted in death metal, the atmosphere is decidedly darker, with the guitars in particular tapping into the raspy, shriek-laden sound that the best of black metal has to offer. The core of Evangelion rests on the guitars, with Nergal helped out on this outing by session shredder Patryk Dominik 'Seth' Sztyber. The rhythms still retain an epic death-metal sound, with the hooks churning out slabs of chest-busting fury, but the leads bring out a darker, moodier atmosphere with a sense of menace. These somewhat contrasting styles work well here, particularly because the percussion remains hard and heavy throughout. Drummer 'Inferno' Prominski is the glue that really keeps things together on this album. Prominski is a machine as he blasts through each track, but he also knows when to pull back and let the guitars to their thing. Bassist 'Orion' Wroblewski is felt more than heard, which is too bad. I would have preferred a stronger presence. As always, Nergal's voice is this band's centrepiece, his thick but raspy approach seething with power and fury. Behemoth also continue to explore the sounds of the middle east, going so far as to showcase such experimentation as minor interludes on some songs, such as Shemaforash and He Who Breeds Pestilence. The band also varies pace a little, giving the music room to breathe and atmosphere to build so that the faster parts feel all the more brutal. 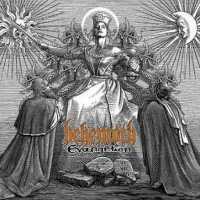 Lyrically, Behemoth continue their journey through the realm of Thelema. An English transliteration of the Koine Greek noun that means 'will', Thelema is an occult-based philosophy driven by Aleister Crowley's infamous The Book Of The Law. 'Evangelion' is a Greek word that means 'good news'; it often refers to biblical stories in which god saves humanity. However, the band uses this term to espouse the reclamation of the self, with the good news referring to freedom from human-driven concepts such as tradition, politics, and religion. The end goal is to be set free from such trappings so as to enter a new state of being. Production on Evangelion is superb, with Daniel Bergstrand (Meshuggah and Dark Funeral) avoiding the traps of fuzz or electronic wizardry. Mixer Colin Richardson (Carcass and Napalm Death) lets every instrument come through, except for the bass, which I feel is underrepresented. Behemoth's Evangelion is easily one of 2009's best death-metal records. This one is highly recommended for fans of the extreme.